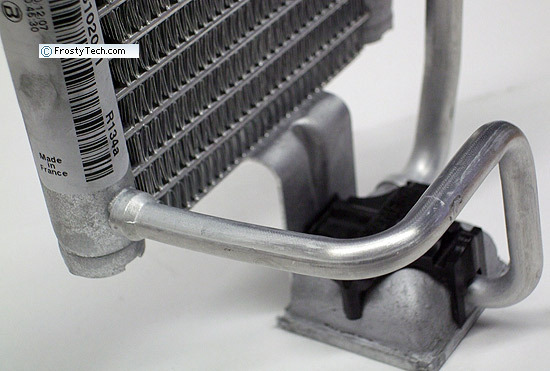 Abstract: Unlike heatpipes which typically use water under a slight vacuum for working fluid, the Revo heatsink is slightly pressurized with a fluorocarbon called R134a. R134a has a boiling point of -26.3°C at room pressure, but in the hermetically sealed system at a slight pressure that boiling point is raised to a level more appropriate for this application. Akasa's Revo heatsink is known as a Loop Thermosyphon Cooler; it functions along the same lines as a heatpipe but relies on gravity instead of capillary forces to return its 'working fluid' back to the hot side. The working fluid is what conducts heat absorbed by the heatsink, from the processor to the heat exchanger, where forced air passing over cooling fins removes it to the surrounding environment. Unlike heatpipes which typically use water under a slight vacuum for working fluid, the Revo heatsink is slightly pressurized with a fluorocarbon called R134a. R134a has a boiling point of -26.3°C at room pressure, but in the hermetically sealed system at a slight pressure that boiling point is raised to a level more appropriate for this application. An example of this is those 'Air Duster' cans we all use to clean keyboards with. 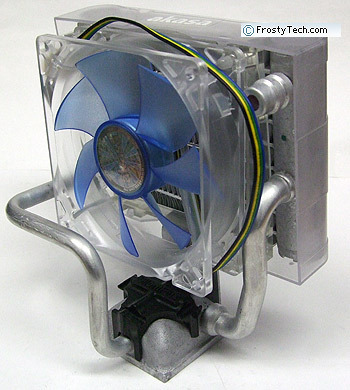 Outwardly the Akasa Revo heatsink looks like a self-contained watercooling system (ie. Corsair H50 ), but unlike a water cooling system it does not use any kind of mechanical or electrical pump to move its working fluid from hot to cold sides. The Revo heatsink is also surprisingly lightweight - the entire device weighs just 330 grams! Frostytech will explain how it all works in just a moment, it's really quite a fascinating bit of thermodynamics. First let's touch on the regular heatsink specs and stats. As far as regular heatsinks go the Akasa Revo installs onto Intel socket 775 and AMD socket 939/AM2/AM3 processors just like any other CPU cooler. Aside from the one requirement that it be oriented properly, there are no other special requirements to its use. The Revo heatsink stands 137mm tall, is equipped with a single 92mm PWM fan that operates at 2200-600RPM and the whole unit weighs a feathery 330 grams. It's hermetically sealed so it never needs to be refilled, there is no pump motor to make noise and the thermosyphon action itself is entirely passive and virtually silent. Externally, forced air from a fan is blown on the condenser (aka liquid-to-air heat exchanger) to cool it and remove the heat to the surrounding environment. This drops the temperature of the working fluid enough for it to condense back to a liquid, which then exits the condenser and returns to the evaporator chamber by gravity through the 'falling tube'. The whole cycle then repeats itself continuously. 1) The 'evaporator chamber' where heat is conducted away from the CPU (above). 2) The 'rising tube' where heated vapour exits the evaporator chamber. 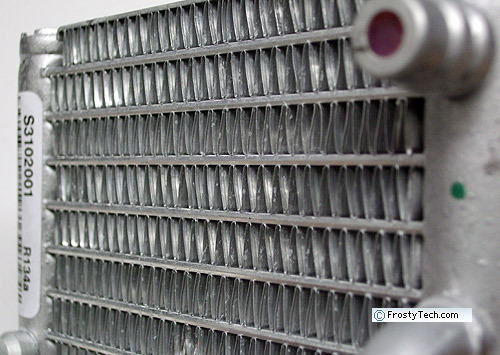 3) The 'condenser' or heat exchanger where the working fluid is cooled back to liquid phase (above). 4) The 'falling tube' where the working fluid returns by gravity to the evaporator chamber. Incorrect orientation of the heatsink can impede the return of working fluid back to the evaporator, effectively causing the Thermosyphon to stall and send temperatures suddenly straight through the roof. 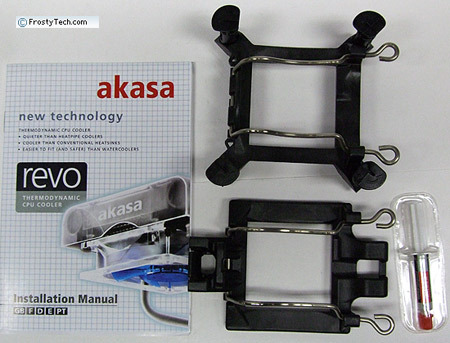 The Akasa Revo heatsink must therefore be installed in a horizontal orientation as per the instructions for it to function properly - the heat exchanger must be above the CPU block. According to documentation from NoiseLimit, the original designer of the Revo heatsink and SilentFlux technique, the company worked to address orientation issues by using a one-way flow valve and encouraging 'flow boiling' rather than 'pool boiling' within the evaporator chamber. Since any puncture of the cooling loop would render this heatsink completely useless, we can't show you what it looks like on the inside. The heatsink installs onto Intel and AMD motherboards with a set of custom plastic heatsink retention cages that first must be mounted to the board. One is for Intel Socket 775 boards and the other for AMD socket 754/939/940/AM2/AM3 platforms. 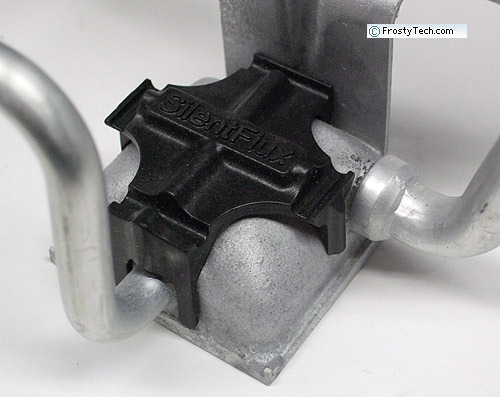 The Intel socket 775 bracket uses the standard push-to-lock plastic clips that insert into the four motherboard holes around the processor socket. 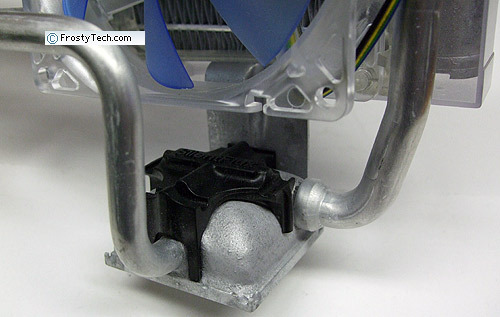 For AMD processors, the custom bracket engages the central lug on the socket 754/939/940/AM2/AM3 heatsink retention cage. List all Akasa heat sinks that Frostytech tested?